It’s amazing what you can find on the interent. 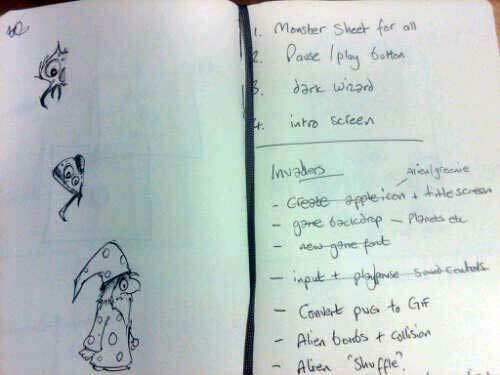 When I first started dreaming up a game with battling wizards I had a very clear image in my mind from my childhood. Back in 1983 I had a Dragon 32 computer. In the US it was the sister machine to the CoCo ?? (I think). Pretty much every game worth playing on it was published by Microdeal. A small firm based in Cornwall, England. The better games (for me) were developed by Ken Kalish. A wonderful game designer with an ear for striking sound effects. One of his finest hours was Dungeon Raid. 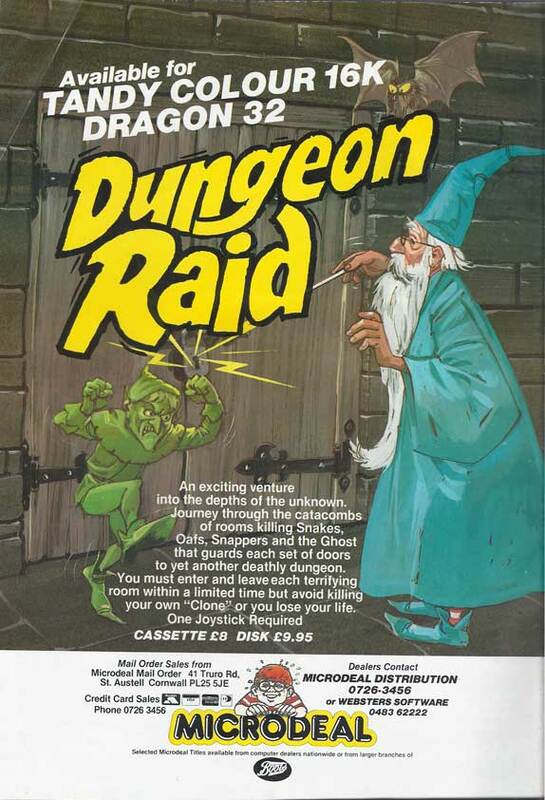 I was so desperate to find the image of the wizard from the cover of the game I scoured eBay for old magazines and Dragon cassettes. Last week I struck gold. A handful of magazines for a couple of quid and the first one I picked up at this on the back cover. The wizard is of course blatantly robbed from Milt Kahl’s wonderful Merlin character from The Sword in the Stone. I pinned this image up above my desk as I coded the game for inspiration. Occasionally it pays to radically shake things up a bit. I’m never satisfied with my games when they’re struggling through that middle period of trying to iron out objectives vs technology vs style. So it’s during this time that I make the most drastic changes and run with them for a few days to see how I feel about them. I did it with Hoth Strike quite a lot when I wasn’t convinced by trying to emulate Defender’s game mechanics. The whole screen scrolling was driving me nuts since it meant I was forced to implement a scanner. But in the end that was a worthwhile exercise. So with Castle Adventure I am now at the point where level objectives and puzzles are at the forefront of my mind. 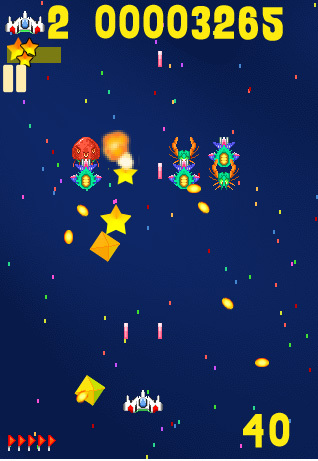 As it stands the game is played at pace with a number of missiles being hurled around by the player. The ghouls and zombies don’t fight back. Their only form of attack is to run head long in to the player and cause damage. 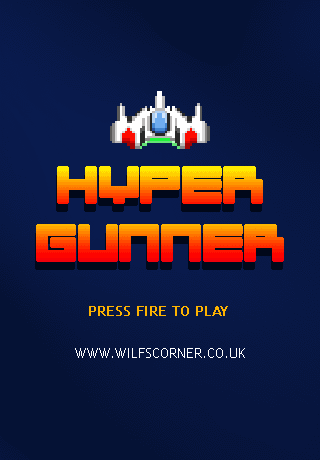 I still rather like that since maze games for me don’t quite cut it when you’re avoiding missiles. 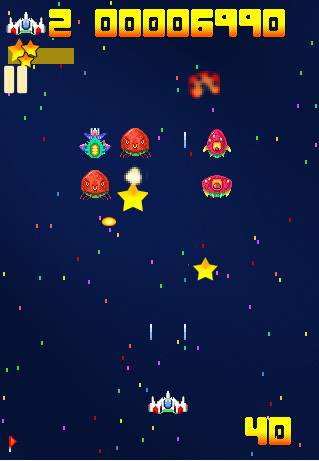 Much better to do it PacMan style and dodge the bad guys. So I sat scratching my head last night and thought about a game whereby you spend more time avoiding and less time hurling magic at enemies. This is precisely what the first Castle Adventure was all about and I really rather like it. I like the stealth nature of it in that you are looking further in to the level to plot your route without relying on the fire button. To best achieve this I knew I had to alter the scale of things and present more for the player to do. So I did just that and came up with a different take on things. 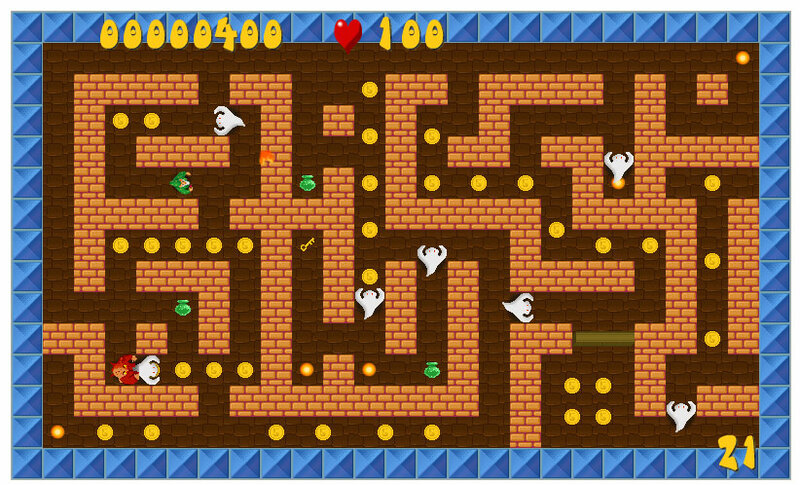 Essentially the player is playing within the same game arena but on a smaller scale. He has much more room to move and a lot more (potentially) to have to solve. I’m so taken by the challenge of avoiding monsters that I’m now also thinking about turning it on it’s head a little. One idea is to have a final locked room that requires a kind of jailer’s key. 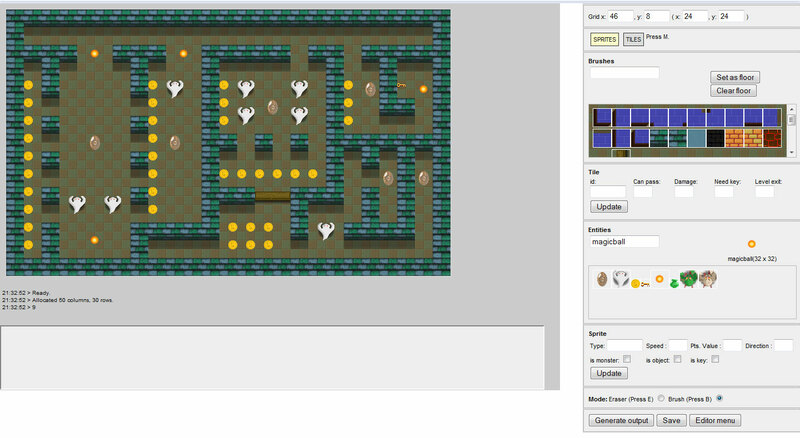 In that room is the level’s objective – perhaps some treasure. But the key is being carried by a jailer who obviously needs to drop it. 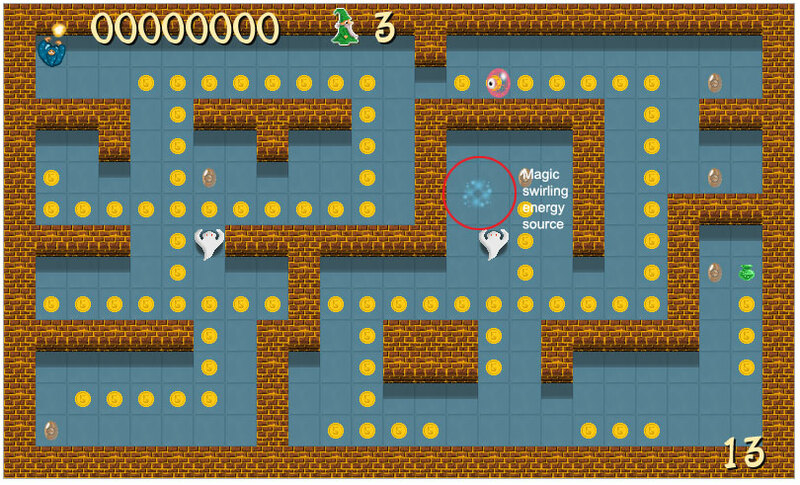 To drop the key the player must stun him with magic. There is an obvious down side here in that there is only a set amount of magic in each level. So I’m looking at respawning magic as an option. Game design is fun when faced with such scenarios. As a rule of thumb I present a scenario for a goal and then flip it on it’s head to find the challenge. It works well most of the time. I may blog some of my game design theory for what it’s worth soon.